Opentoonz is software for producing a 2D animation. It is based on the software "Toonz", which was developed by Digital Video S.p.A. in Italy, customized by Studio Ghibli, and has been used for creating its works for many years. Dwango launches this OpenToonz project, in cooperation with Digital Video and Studio Ghibli. Introduced New Theme: Astral_048, 072, and 128. Color filtering feature for columns in camstand view. New options for input cells in xsheet effectively. Subfolder popup for the camera capture feature. Scrubbing the timeline options with shift + wheel. Sound playback in combo viewer. Fixed crash on loading a sequence with a malformed frame number. Fixed crash on applying shortcut preset. Fixed crash on unfreezing preview. Fixed crash on unlinking the level while opening the history panel. Fixed crash on saving the scene containing a missing AIFF level. Fixed crash on pressing arrow keys in the level strip. Fixed crash on running tconverter. Fixed crash on expanding history. Fixed crash on undo the paste into command with cell selection. Fixed crash on setting the camera scale to 0. Fixed crash on using the "skeleton mode" shortcut with the plastic tool. Fixed crash on rendering long scene with FFmpeg. Fixed crash on touching empty Flipbook. Fixed crash on switching raster level tools. Fixed crash on changing frames while dragging the vector eraser tool. Fixed assertion failure on screen pick. Fixed saving menu bar in non-English environment not to lose English titles. Fixed auto-save behavior for untitled scene. Fixed confliction warning with pixels only mode. Fixed preview fx updating render result. Fixed invalid scene path when import scene from sandbox to another project. Fixed the flipbook’s console to be updated when the "Blank Frame" option is changed. (Partially) fixed vector shapes unfillable. Fixed the "Convert File" command available from main menu bar. 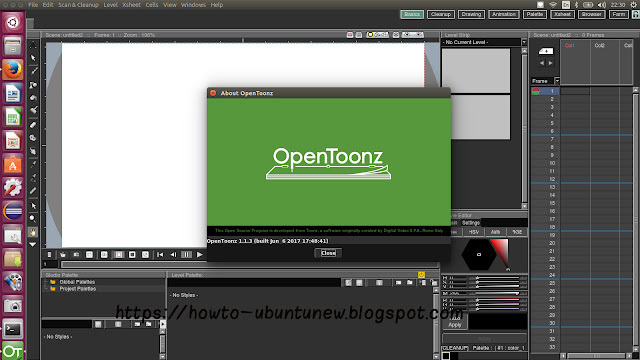 The GetDeb repository contains the latest packages of OpenToonz, available for Ubuntu 16.04, Ubuntu 17.04, and derivatives. And you can remove the getdeb repository via Software & Updates utility under Other Software tab.